PSL 2019 Online Tickets - Where to buy HBL PSL 2019 Tickets? PSL 2019 Online Tickets – Where to buy HBL PSL 2019 Tickets? Buy PSL Online Tickets for Pakistan Super League 2019. PSL 4 is starting from 14th February in U.A.E and Pakistan. PCB has announced the procedure to buy PSL 2019 Tickets online to watch live cricket match in the stadiums. The Cricket fans are searching for how to buy PSL match tickets. Where to buy PSL 2019 Tickets Online is available here? PSL Online Tickets – Where to buy PSL 2019 Tickets? 1 PSL Online Tickets – Where to buy PSL 2019 Tickets? PCB has announced the PSL 2019 will be starting from 14th February in U.A.E. However, the last 10 matches and final will be hosted in Pakistan. A total of six teams will be participating in this season of PSL. But, the cricket fans have already started searching for online sources to buy and book the PSL 2019 Live match tickets. This article provide all the details about Where to buy PSL 2019 Online Tickets? 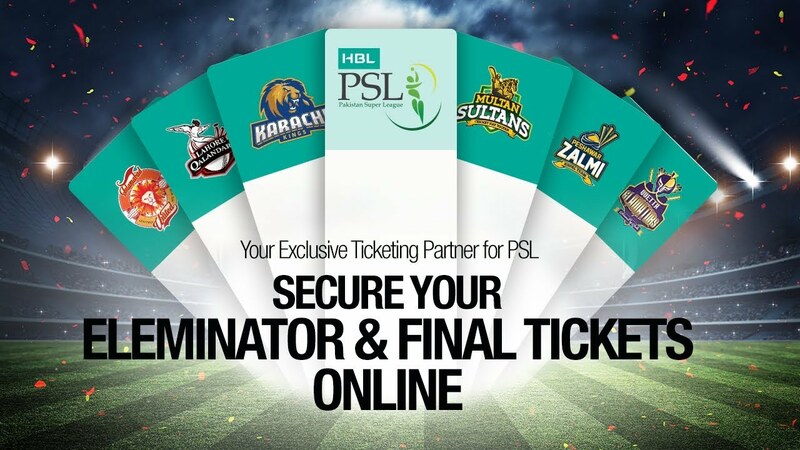 Like every season, PCB has announced the official partners and online sites that will be selling PSL 4 Tickets online. We recommend to buy these thickets from these sites as soon as possible, because due to the limited tickets, Tickets may run short very soon. Apart from online purchase, you can also Buy PSL 4 tickets from the following places. Moreover, you can also buy PSL Live match Tickets from TCS offices in Pakistan other than above places. All the tickets prices for PSL 2019 Matches are provided here. However, we recommend you to visit the PSL 2019 Schedule, to check and compare the PSL 4 Ticket Prices before you buy them online. The Gaddafi Stadium Lahore is a historical cricket stadium. It has hosted many epic cricket clashes in the past, however this year it will be hosting 28th, 30th and 1st Qualifier Matches in PSL 2019. The Tickets Price for Gaddafi Stadium start from 1000 and reach to 6000 Pakistani Rupees. You can buy the Ticket for Majid Khan, Zaheer Abbas, Hanif Mohammad, Inzamamul Haq, Javed Miandad, Sarfraz Nawaz, Saeed Anwar, Wasim Akram, Saeed Ahmed, Imtiaz Ahmed, Quaid, Abdul Qadir, Imran Khan, A.H. Kardar, Waqar Younis, Nazar Mohammad, Rajas, Fazal Mahmood Enclosures. The Online Tickets for Gaddafi Stadium Lahore are available online and at shops. Hurry up! so that you do not miss to witness your favorite team in action. Karachi is the largest city of Pakistan and Karachi Stadium has hosted many international matches in Pakistan. Recently, Karachi Stadium hosted a T20 Series between Windies Women and Pakistan Women Team. This year, Karachi Stadium will be hosting the 27th, 29th, Qualifer 2, Eliminator 2 and Final of PSL 2019. Hence, you can purchase the PSL 2019 Tickets for national Stadium for different Enclosures. The lowest price for Karachi Stadium Ticket is 1000 Rupees, whereas you can buy a VIP ticket at the cost of 12,000 Pakistani Rupees. 1000 Rupees: Intikhab Alam, Nasimul Ghani, Iqbal Qasim, Mohd. Brothers, Wasim Bari Stands. 4000 Rupees: Majid Khan, Waqar Hasan, Asif Iqbal Stands. 8,000 Rupees: Zaheer Abbas, Imran Khan, Wasim Akram, Quaid, Special Children Stands. Duabi Cricket Stadium is modern Cricket Stadium in Dubai, that has hosted many international matches in the Past. This year, Dubai Cricket Stadium Dubai will be hosting 1st to 7th and 16th to 22nd PSL 2019 matches. The tickets Price for Dubai Stadium starts from 40 AED and ranges up to 295 AED. However the weekend tickets price usually cost a little more than normal days at 125 AED to 290 AED. Sharjah is one of the largest states in U.A.E and Sharjah Cricket Stadium is famous for hosting Sharjah Cup matches back in 90s. However, this year Sharjah Cricket Stadium is set to host 8th to 15th Matches for PSL 2019. You can buy Sharjah Stadium prices at a cost ranging from 20 to 180 AED. This is an informational Article about PSL 2019 Tickets and where to buy them. We at Sportsala do not encourage nor support or sell Tickets Online. Therefore, we will not be responsible for any identity theft or credit card information stealing related issues. Hence, we recommend our users to buy online tickets from the official sites always.